FC Pune City registered only their second win of the season after the 1-0 defeat of Kerala Blasters at the Jawahar Lal Nehru Stadium in Kochi on Friday in the Hero Indian Super League (ISL). The visitors were rewarded for their dominating first-half performance as they shrugged off a lethargic Kerala Blasters team, who are yet to win since their triumph over ATK back in September. The Stallions took the lead through Marcelinho in the 20th minute when the Brazilian's shot took a touch off Anas Edathodika on the way to the back of the net after he was played through on goal by Ashique Kuruniyan, who conjured a stellar performance on the night. Pradyum Reddy was not shy of applauding Kuruniyan for his performance and hailed his performance as "fantastic", while also suggesting that he is an invaluable talent to both club and country due to his ability to contribute in attack and defence. The 21-year-old winger, who has already scored for India at the senior level, was a tireless worker on the left flank for the visitors and proved his credentials time and again during the game. Reddy admitted that Kuruniyan's rise has been meteoric and claimed that he deserves all the credit he is getting at the moment for such a spectacular performance on the night. “If you look at Ashique’s progression this year, there is a reason why he is breaking into the national team,” Reddy told Sportskeeda during the post-match press conference. “It is because as a player he can perform both sides of the game, both the attacking and defensive side. “It is crucial to the national team that he does that and if you want to play at the higher levels and be a player that should be one of the first names on the team sheet, then you have to do both aspects of the game. “I thought he was fantastic today and he deserves all the plaudits he is getting, but he has to start doing it for 90 minutes now. “Ashique’s always had a goal-scoring knack even as a youth player and what we worked on him from last season was just to add to the end product, which makes him unpredictable. “It’s still a work in progress, but it is coming off quite well with him getting an assist today and already scoring this season," he admitted. Pune City played to their strengths during their first ever win over Kerala Blasters in Kochi and Reddy revealed that it was mostly down to the amount of research they did on the hosts ahead of the crucial meeting on Friday. The interim coach also added that his team executed the plan of exploiting Sandesh Jhingan playing out of his best position quite comfortably, but admitted that he felt the game could have been a lot easier if they had taken their chances in the first half. 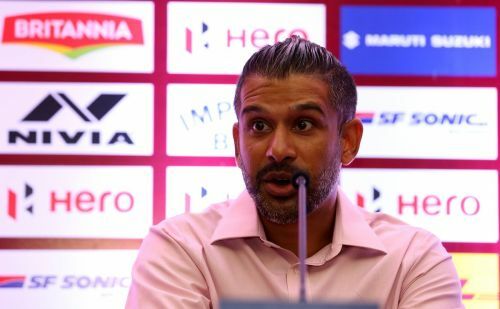 “We had done our homework on how Kerala Blasters have played in the last few games,” Reddy told reporters during the post-match press conference. “We wanted to exploit the fact that Sandesh was played out of position and because when he is played out of position, certain gaps appear in their team and the idea was to exploit those gaps and I think we did that well in the opening 20 minutes. “But I also think we just didn’t put our chances to bed, we just scored one goal and we probably should have had one before that, it would have been a lot easier to hold on with a two-goal advantage rather than just the one goal." Reddy also refused to rule out the possibility of the Stallions making it to the playoff stages of the ongoing season by admitting that is still mathematically possible. However, the Pune City coach conceded that it will be a herculean task since they need to win all their games and wait for other results go their way. “With any team and any coach, you are going to try to play to win every single match. That is always the plan," he continued. “I unfortunately can’t control what Mumbai, Jamshedpur, NorthEast and the teams above us do. So we just have to keep winning our games and see where we can go. Iain Hume clocked the full quota of 90 minutes for the first time this season, since his return from injury, against his former club Kerala Blasters and Reddy admitted that his return is a huge boost to the team. Furthermore, Reddy added that he will play an integral role in the second half of the season after returning to his best shape in recent weeks. The Pune City interim coach also revealed that Hume is an influential figure in the dressing room and admitted that the Stallions missed his services very dearly during the early stages of the season. Reddy even went on to claim that Hume's desire and hunger helped him push himself to complete the entirety of the game and hailed the striker for working tirelessly for the team. “Absolutely [Iain Hume’s return to action is a huge boost for us]. We have all seen what Hume has done in this league over the last few seasons," Reddy told reporters during the post-match press conference. “It’s not just what he does on the field, it’s his presence in the dressing room, his experience, the way he helps the younger players in the team and that was something that we missed at the start of the season. “He still probably was not ready for 90 minutes, but I think the desire that he has and he wanted to play in front of these fans and prove that he could still do it. “I think that adrenaline gave him that extra 15 minutes to get the old legs going in the end," he added. FC Pune City, who are now only a single point behind seventh-placed Kerala Blasters in the league table, will next face FC Goa at the Balewadi Stadium in Pune before they enter the ISL's first ever mid-season break.